Is it possible to expand your event or marketing organization while providing business continuity and managing risk? Crawford Group has been helping companies do this for 17 years. Using a managed service model, we partner with companies to build the right team. Then we take control of all or parts of the outsourced team using Service Level Agreements that include reporting metrics so you can track how we’re doing. Do you need to grow your marketing skills and expertise without adding headcount? Do you need to maintain business continuity through times of organizational change? If your consultant takes vacation or is out ill, who arranges backup coverage and tracks assignments? If your consultant leaves the assignment, who finds a replacement? Who tracks your consultants to ensure that they’re compliant with managed service or staff augmentation guidelines? At Crawford Group, we assume the risk of transition, backfilling positions, and operations excellence across the team, so you can focus on business strategy, brand management, and core marketing management. 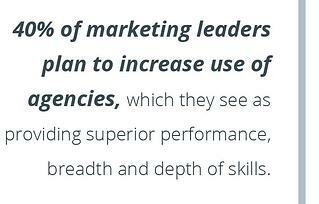 In a recent report, The 2016 Gartner Marketing Organizational Design and Strategy Survey, Gartner exposed, “…a lack of internal team coordination, a skills gap and other shortcomings prevented marketing leaders from delivering business outcomes that match expectations.” The results of the survey found that more than 40% plan to increase use of agencies which, they perceive as providing superior performance, breadth and depth of skills. Learn more about managed marketing services and how they can increase your productivity, lower your risk, and reduce costs. Or send us a quick message using our contact form to discuss the possibilities. Why It May Be Time To Outsource Marketing.